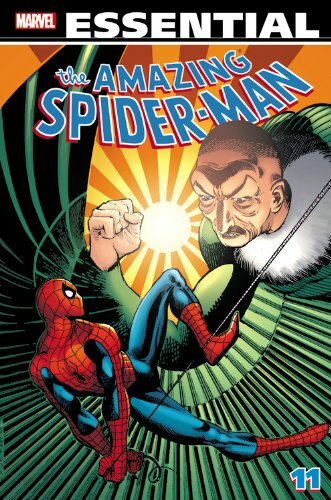 Overview: OK, if you have been following along at home, so far I have written five reviews for Essential Peter Parker the Spectacular Spider-Man, four volumes of Essential Marvel Team-Up, and this will be the eleventh volume of Essential Spider-Man, highlighting the run in Amazing Spider-Man. So on the off-chance I repeat myself at any point in this review, just understand that there is a good reason why I might re-use a joke or line. Because if comics has taught me anything, it’s that you re-use whatever works best as many times as you can! As we left off with the last collection, these issues are primarily done by writer Roger Stern and artist John Romita Jr. For as many good teams that have worked on Spider-Man over the years, this may be one of my favorite creator teams to ever work on Amazing Spider-Man. In these stories, Peter Parker is focusing on his photo-journalism work for the Daily Bugle. In his personal life, we see Mary Jane Watson becoming more of a potential romantic interest for Peter, but she’s not the only one. The highlight of this volume has to be the introduction of the Hobgoblin. Someone has discovered one of Norman Osborn’s secret labs and has modified the Green Goblin identity for his own purposes. It makes for an intriguing storyline (not really seen since the time the Green Goblin was first introduced) as Peter (and the readers) try to unravel the identity of this new costumed villain. The Hobgoblin became a break-out star in the Spider-Man books, building up over a year’s time to a fiery conclusion. Another character introduction comes with a familiar name, as Roger Stern and the John Romitas (Sr. and Jr.) gave us Monica Rambeau, the new Captain Marvel. Obviously, Marvel did this as a way to maintain the rights to Captain Marvel, keeping it away from DC Comics. This Captain Marvel was able to transform into any form of energy and developed into a strong character even after she ceded the Captain Marvel name, becoming first Photon and then Pulsar. While introduced in the Amazing Spider-Man Annual #16, Stern would bring her onto the Avengers team during his five-year run on that title. One of my all-time favorite Spider-Man stories comes at the end of this collection, with “The Kid Who Collected Spider-Man” from Amazing Spider-Man #248. This came during Marvel’s infamous Assistant Editor’s Month when many titles decided to have fun with issues that month. But we get an incredibly touching backup story from Roger Stern and Ron Frenz. Spider-Man pays a visit to a young boy named Tim, who claims to be Spider-Man’s biggest fan. Peter shows off for Tim, answers some questions, and then shares with Tim his secret identity. It’s only an 11-page story, but I still tear up every time I read this. What makes this Essential? : I really enjoyed this volume. Obviously, the introduction of Hobgoblin was significant at the time, but it seems diminished now looking back on it more than 30 years later. John Romita Jr’s art really shines in the black and white format, and I believe Roger Stern is a criminally underrated writer who doesn’t get the proper recognition he deserves. Stern helps usher in a new era to Spider-Man and Peter Parker in particular, moving his away from his graduate studies and focusing more on his photojournalism work. If you like this volume, try: the Spider-Man: Origin of the Hobgoblin trade paperback. My biggest complaint is that this collection stopped three issues too short. This book needed to include Amazing Spider-Man #249 to #251, which would have wrapped up not only the Hobgoblin storyline (for now) but also the red-and-blue costume era as the black symbiote costume is introduced in #252. The Hobgoblin story had been building for a year, causing a lot of speculation as to the identity of the villain. If you can’t track down the individual issues, find this trade paperback to complete the story. This entry was posted in Marvel Essentials, Spider-Man and tagged Bill Mantlo, Bob Hall, Ed Hannigan, John Romita Jr., Roger Stern, Ron Frenz, Spider-Man. Bookmark the permalink.